KIEV, Ukraine -- The Ukrainian government began mobilizing its sixth and final wave of troops for active duty in the East Ukraine conflict on Thursday. 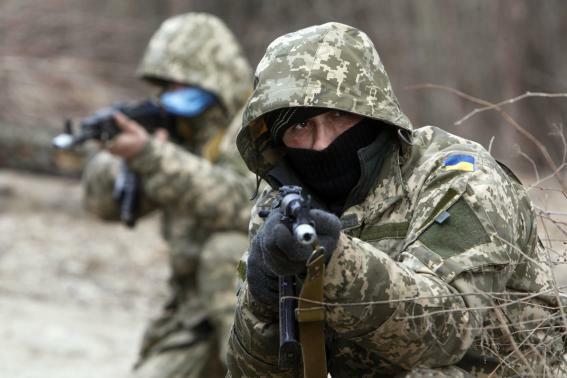 Newly mobilized Ukrainian paratroopers aim a weapon during a military drill near Zhytomyr March 6, 2015. While the exact total of how many people will be called upon is not known yet, the chief military prosecutor of Ukraine, Anatoliy Matios, said in January he expected the figure to be around 50,000. Kiev’s armed forces are looking for scouts, tankers, gunners, signalmen, engineers, mechanics and drivers. The news will be welcomed by the embattled soldiers currently serving in the 15-month-long conflict in the contested region of Donbas. Despite a ceasefire mandated by the Minsk II agreement that came into force in February, the Ukrainian army continues to lose soldiers on a daily basis to the rebels. "Over the last day, we have lost three Ukrainian soldiers, and another 14 were injured as a result of military clashes," said Colonel Andriy Lysenko to reporters on Thursday. The pro-Russian rebels, who are being complemented by Russian troops and equipment according to NATO and Western officials, are also seeing large numbers of casualties in clashes with Kiev troops. It was also reported by pro-Ukrainian media that Russian-backed militants had made as many as 79 attacks against Ukrainian army positions over the last 24 hours, which would make it one of the more intense days since the ceasefire was signed in February this year. The continued clashes, in direct violation of the ceasefire have left many wondering how the conflict could come to an end. On Wednesday prominent Russian opposition activist Mikhail Khodorkovsky said that he didn’t see such an end in the near future. "A freezing of the conflict is the only reasonable expectation," Khodorkovsky said during a speech at the Atlantic Council in Washington, while also warning that sending U.S. weapons to support Kiev’s cause would only make the war worse, adding that "this situation is going to keep on developing in this direction if [U.S.] arms start being shipped to Ukraine," he said. A resolution passed by the U.S. House of Representatives calls for doing just that, but President Barack Obama has so far refused and there are no U.S. immediate plans to send weapons on top of the military support equipment being given to Ukraine. Khodorkovsky also predicted that the standoff between Kiev and Moscow over the annexation of Crimea and the war in East Ukraine could last as long as the division of North and South Korea, which began in 1948 and continues today. With all respect to Mr. khodorkovsky; I believe Mr. Khodorkovsky as furious Russian nationalist project's his personal wishes on current situation in Ukraine. war in Ukraine for Russia significantly in parallel with political pressure. Such weapons will allow Ukraine to protect areas of economic significance for self proclaimed republics and by doing so, Ukraine will keep pressure on them.